As the second princess of the elves of Lessa she is the acting regent of her people and is expected to behave with the serene grace and poise of a model elf. But that is not who she is. Instead, her very character is constantly criticized as being too passionate, too fiery, and overall “too much”. The former Crown Prince of the human country of Calnor, Benjimir’s disinheritance has permanently altered his future and place in court. It gets worse. He is forced to watch as the woman he has secretly loved his whole life narrows down her marriage prospects. He may ordinarily revel in his own ruthlessness, but this feels like his heart is dying. Gwendafyn is given a chance to flee the role that has ensnared her when she realizes there is one escape that not even her family traditions can prevent: marriage to a human from Calnor. With most humans and elves unable to speak the same language, her options are limited. She starts to lose hope when the human translators only see her title and treat her with fear and awe. Yet there is one other human who can speak the language of the elves: the scorned Prince Benjimir. But Gwendafyn isn’t that desperate. It starts as a marriage of convenience and an opportunity to strengthen the bond between their two peoples. But what if it could become something more? ROYAL MAGIC is a clean romance set in an epic fantasy world filled with elves and magic. If you love sweet romances, humorous stories, and fantastic adventures you’ll love the Elves of Lessa series. Download a sample or buy it today! I absolutely loved this book. It was the perfect sequel for Red Rope of Fate. I simply could not put it down. It is very different from the 1st book but still a beautiful story of overcoming differences and discovering a surprising and unexpected love. I cannot wait for more of the Elves of Lessa. "Royal Magic" by KM Shea is the sequel to "Red Rope of Fate" and I would recommend reading the first book first, but you could enjoy "Royal Magic" on its own. This book has to tread the difficult path of turning a villain into a hero - and KM Shea manages it really well. Benjimir's personality is explained and accepted via the heroine's point of view and actually becomes part of why she loves him. This matching of two difficult characters is a lovely part of the book. There is also plenty of action, entertaining characters and solid world building. A very satisfying fantasy novel. loved that this got away from some of the elvin tropes (eg immortality - so boring). Also this author had some creative ways of showing language disconnects between different cultures - engaging and effective. Read the first book too! they're both great; I hope there's another one. 5.0 out of 5 starsLoved it. I stumbled on this in KU and liked it enough that as soon as I read book one I am buying them both. I read it in one sitting and can’t wait for book three in the series. Let me begin by making 2 disclaimers: First, I'm a sucker for marriage of convenience books. Secondly, I really enjoyed the first book in this series, Red Rope of Fate. I recommend reading this book, as I really, really liked it. Is it perfect? No. Could it be improved? Probably. I read the one star review and I understand what she is saying, but I am a fan of Ms. Shea and have been for a few years. I like her books (although there is one that I didn't really care for), and I can rely on her books for good clean fun, witty dialogue, good characters, magical worlds, and sweet romance. I didn't mind all the political maneuvering in this book, as it is also in Red Rope of Fate. There were a few areas that were a little clunky, and I wasn't too crazy about the ending, but overall I really enjoyed it, and I have already reread the book. I'm a mom of a teenager, and I like that I can share Ms. Shea's books with my daughter. Not only did I like the marriage of convenience aspect of the book, but I also enjoy the elvish culture vs. human culture context. Once upon a time in a faraway land, an odd duckling Elf princess proposes a marriage of convenience to a disgraced human prince. To her surprise and gratitude, he agrees. Let me say up front that my absolute FAVORITE part of this book is how Benjimir is so SUPPORTIVE of Gwendafyn. They married for mutual benefit, and both before and after they grew closer together, that baseline of mutual respect and support NEVER FALTERED. Furthermore, I really enjoyed the return to this world and this cast of characters! Tari and Arion, Yvrea and Claire, Celrin and Petyr, Seer Ringali and his weaponized accessories, Arion's "minions" (though I think of them as Tari's minions xD), etc., etc. Everyone had their moments without detracting in the least from our current heroes. 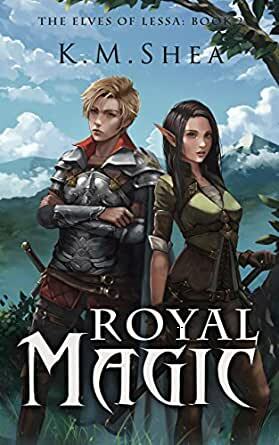 If you enjoyed Red Rope of Fate, I GUARANTEE you will enjoy Royal Magic. 5.0 out of 5 starsThis is definitely a favorite, and a sure re-read in the future! Yes, I read this book in one day. Stayed up late and everything, but I don't regret it. I was worried when this book came out that it wouldn't live up to the first book. I loved that one (re-read it several times) and it has been so many years. I wondered if the author would be able to recapture the same feel as the first one. I really shouldn't have worried. This book was amazing! And I think I might even like it better than the first one, which is saying a lot. All of the characters we loved from the first book are back, even if they aren't main characters. Tari and Arion get a lot of screen time, and it has the perfect balance between including them a lot yet not letting them take over from the main characters. Not that Gwendafyn and Benjimir would let that happen easily. Both of them have such BIG personalities they take over the scenes they are in. I adored Benjimir's character arc. It was so, so, so well done! There was one point where it seemed like his switch between brooding to being more loving to Fyn happened rather quickly and I wished we'd had a scene from his POV to show what he'd been thinking when he'd been gone hunting bandits to have the chance happen, but that was my only minor complaint about the book. This is definitely a favorite, and a sure re-read in the future! I have a bias for Anti-heroes, and villains or antagonist who become protagonist. But, Benjamir was a character I couldn't see becoming a convincing protagonist. I'm glad I was wrong. K.M. Shea didn't try to make him anyone other than who he is. Benjamir is not a nice guy, but his Devil-may-care attitude made him the perfect match for Gwendafyn who is the foil to her sister. I liked that we were able to explore other characters from Red Rope of Fate more. My only gripe is I wish we had more Benjamir POV's and a few more scenes of them together before the wedding. Read the book twice in two days.